In 1929, Indiana FFA was founded as a youth organization for farm boys, but has grown into an organization that has something to offer everyone. Today, Indiana FFA has more than 12,500 members and is definitely making a positive impact on hundreds of communities across the state. Indiana FFA provides high school-aged students with challenging opportunities to develop leadership skills, problem-solving skills, and explore potential career opportunities. Indiana FFA members can be found not only in rural communities, but also in many suburban and urban schools in Indianapolis, Ft. Wayne, Lafayette and Beech Grove. 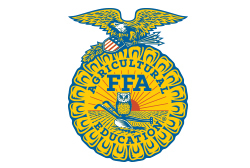 Annually, 11 leadership conferences are offered to Indiana FFA members. These conferences, which are presented by student leaders, allow for a creative and fun way to help youth develop positive character traits and habits. Altogether there are more than 200 activities to engage FFA members. One of the FFA’s most effective and practical learning tools is the Supervised Agriculture Experience (SAE) program, which allows students to apply skills they learn in the classroom. Examples of SAE programs include working in a feed mill, conducting research in a laboratory, producing vegetables, or working in agricultural communications. The employer and local agriculture education instructor supervise the work experience program and monitor the progress of the student. Currently, there are thousands of SAE projects being conducted by Indiana FFA members across the state.